Wake up hung over. Stumble out of bed and into the shower. Get dressed and head to the station without breakfast. Work a full day, go out drinking with friends / co-workers / clients / by myself. Go home, fall into bed and start it all over the next day. For me, this was a routine that lasted years and I couldn’t get out of it. I ate whatever happened to be in front of me without a second thought to what I was putting into my body. I gained weight and lost the ability to focus on anything for any length of time. Then I heard about the Ginja Ninjas and their event, Executive Fight Night. The premise was simple; take a bunch of out of shape executives, send them through a 12-week boxing crash course and have them fight in front of Tokyo’s business elite. Sounded great and I wanted in. The only problem was that I wasn’t in the country for try-outs. I tried to schedule other dates to be assessed but in the end I was asked to try out for Executive Fight Night 2 in early 2013. Fast forward to November of 2012. I was lucky to attend the first Executive Fight Night and fell in love with it. The Ginja Ninjas had created the most cutting-edge, exciting social event on the Tokyo calendar and I said to a colleague that I’d be in the next event. I went to the gym the next day, signed up and have been training in one way or another ever since. 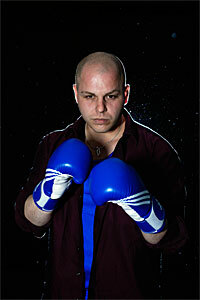 Currently myself and 13 others are in week 7 of our training for Executive Fight Night 2 on May 24th, 2013. I’ve made it past the first two rounds of cuts out of a total of 50 odd people who tried out and made it to the final 14 who will fight on the night. A couple of weeks ago as we were getting our photos taken for the promotional materials I overheard some other fighters remark what a strange thing we chose to participate in. This got me thinking for the first time since I started this journey as to why we wanted to do this in the first place. While I certainly can’t speak for everyone I am an expert on myself. I’m stubborn. Despite knowing that my lifestyle was bad for me, I didn’t stop (notice I avoided the word “couldn’t”). I tried working out by myself and always found a reason not to. I listened to others more out of shape then me talk about wanting to get into shape gradually, the “my pace” crowd. I quickly found that “my pace” was euphemistic for “I don’t want to commit to anything because I’m too scared I’ll fail.” I argued with myself that I’ll always work out “tomorrow” except that word never changed, it never became “today”. Then I committed to Executive Fight Night. I wanted it more than I was scared of failure. Walking out to a ring in front of 600 people screaming for a good fight was what finally overcame my stubbornness. I had finally committed to something. Now, I still weigh the same but my body’s shape is changing for the better. I don’t get drunk anymore. I go to bed at decent times and get enough sleep. I don’t fight with my fiancé anymore and I have more fun with my kids. I laugh more with my co-workers and clients and most importantly I feel more alive. Sounds like an exaggeration but it isn’t. Most times people always talk about what they would do “if”. With this, there is no “if”, just “do” which feels better then any drug out there (in the long term anyway). I still haven’t answered the why though. Am I a narcissist or a megalomaniac? Probably a little I suppose but it isn’t the main reason. I want this to show my colleagues, investors, family and friends that regardless what you want, all you need is the rocks to go and get it. You believe in yourself first. Then you set about proving to other people you deserve their belief too. In the beginning you think it is all you but as you move forward you realize quickly that without all the support you get from your family, friends, colleagues, training coaches and partners, you wouldn’t be where you are; staring down the barrel of an evening you’ll never forget. Adam German is the General Manager of realestate.co.jp. Japan’s largest bilingual online real estate portal.